There is a lot of things one can see and do in Belfast. This unique city, packed with world-class museums, vibrant art scene and rich history has something to offer for everyone. 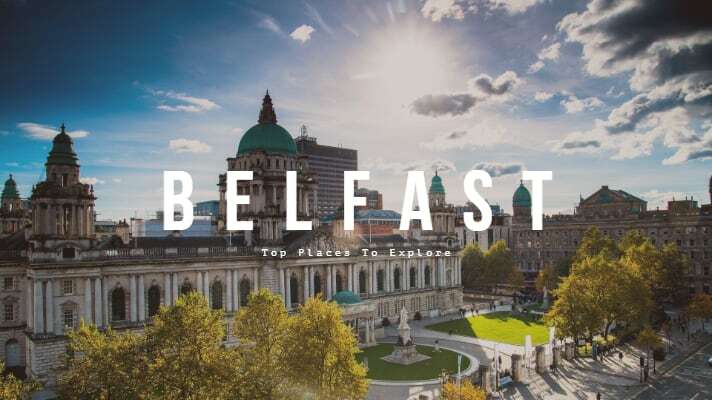 Whether you want to explore this busy city, its countryside or the stunning coastline, Belfast is certainly a place to add to your bucket list. The city is the birthplace of the RMS Titanic, and the Belfast Titanic museum tells the sunken cruise liner story. The museum, dedicated to the world’s most famous shipwreck, opened its doors to the public in 2012. The venue design represents two ships being built side-by-side in the Harland & Wolff shipyards. Here you can learn about Belfast’s industrial heritage and the Titanic history through numbers of interactive displays. The Belfast Titanic museum will take you at least half a day to explore. Built in the early 20th century, this impressive Edwardian civic building proudly stands in the centre of the city. The Belfast City Hall Exhibition offers a journey from the city’s past to the present, showing the vibrancy and diversity of Belfast City Hall across six themed zones. The exhibition is free for individuals, and if you want a guided tour, for £3.50 you can hire headphones and listen to an audio tour. The Belfast City Hall grounds hold the Titanic memorial as well as a number of statues and artwork linked to public figures such as Queen Victoria or President Clinton. St George’s Market is home to the best and freshest produce and local gifts with customers travelling near and far to visit the Friday, Saturday and Sunday markets here. The building dating back to 1896 is the last surviving Victorian covered market in Belfast, Northern Ireland. Here you can find the St. Georges Market Belfast opening hours. Visitors to the Cave Hill Country Park can enjoy panoramic views across Belfast from vantage points on the hillside. This stunning yet challenging circular route begins at Belfast Castle and follows the greenway marked arrows. You can, however, start from several different points at Bellevue car park, Upper Hightown Road or Upper Cavehill Road. The Cave Hill, contains many natural, archaeological and historical features. The park, named for the five caves located on the side of the cliffs includes the incredible Belfast Castle. Set on the slopes of Cave Hill, 120 meters above the sea level proudly stands the Belfast Castle. Its location provides sweeping views of the city of Belfast and Belfast Lough on a clear day. This 19th century Scottish Baronial style castle makes for a perfect city break, event or a wedding venue. The first of the peace walls, built in 1969, was set as a temporary solution to the problem of keeping Republicans and Loyalists apart. Overtime almost 100 peace walls were built separating Catholic and Protestant areas. The biggest and most famous wall divides the Falls and Shankill Roads in the western part of Belfast. It runs for several kilometres and divides several junctions with large metal gates across roads. The Stormont Parliament buildings are one of the best known and most striking pieces of architecture in Northern Ireland. Located only 15 minutes from the city centre, set in parkland, enjoy imposing views across Belfast, the Black Mountain and Belfast Hills. Crumlin Road Gaol first opened its gates to prisoners in 1846 and for 150 years was a fully operational prison until 1996. Today the prison museum allows you to see the prison wings, execution chamber, tunnels to the courthouse, and learn about the history of its walls and the impact on life in the region. Book a tour well in advance if you wish to explore this fascinating place. The jail’s pedestrian entrance is on Crumlin Rd, and the carpark entrance can be accessed via Cliftonpark Avenue to the north. Filming of seasons 1-7 took place in around 25 locations around Northern Ireland including Titanic Studios in Belfast, Cushendun Caves, Murlough Bay, Ballintoy Harbour, Larrybane, Antrim plateau, Castle Ward, Inch Abbey and Downhill Strand. All of these locations are within easy reach of Belfast. If you are true Game of Thrones fan, your schedule has to include some of the filming sites. One of the most popular day trips from Belfast consists of the Giant’s Causeway situated on a spectacular coastal route. The Giant’s Causeway is Northern Ireland’s only UNESCO World Heritage Site with one of the world’s most spectacular drives packed with scenic views. With over 40,000 interlocking basalt columns the site is awe-inspiring. If you are planning to explore Cork, Dublin or Galway, make sure to read our guides! Love Castles? See this post on the best 10 castles in Ireland. Enjoyed this post? Make sure to pin it for later.